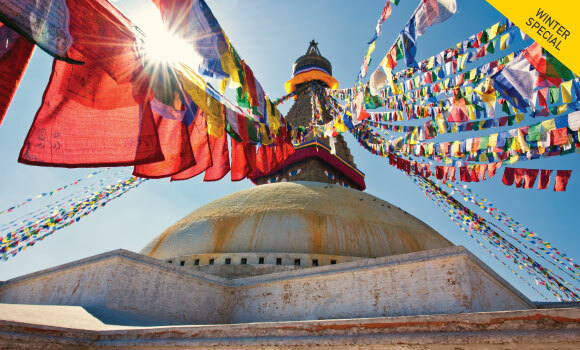 Lying between the majestic Himalayan range and the sultry Indian plains, Nepal is a land of lush green valleys, towering snow peaks, yaks and yetis, monasteries and prayer flags fluttering against the blue skies. KATHMANDU: The valley is historically termed as “Nepal Proper” and has been the home of Newari culture, a cosmopolitan urban civilization in the Himalayan foothills. CHITWAN: Chitwan National Park is one of Asia's richest and the most spectacular National Park. It is situated 75 air miles southwest of Kathmandu. POKHARA: Pokhara is a place of remarkable natural beauty. The enchanting city has several beautiful lakes and offers stunning panoramic views of Himalayan peaks. Assistance upon arrival & transfer to hotel. AM: Sightseeing to City Durbar Square & Swayambhunath. KATHMANDU DURBAR SQUARE: Kathmandu’s number one tourist attraction swarms with life. Though a few of the square’s 50-plus monuments date from the 12th century, most are from the time of the Malla Kings. Probably the most famous building here is the Kumari Bahal, a building richly decorated with beautiful woodcarvings, which is home to the Royal Kumari, the Living Goddess, a manifestation of the great goddess Durga. Nearby the former Royal Palace is a Mall Dynasty dwelling, once considerably more extensive than today. Within, the courtyard Nassal Chowk, originally hosted dramatic dance performances, now it is the coronation site of the Shah kings and contains some of the finest wood carvings you will see anywhere in the kingdom. PATAN: Patan, the ancient city, once a kingdom in itself, is situated across the Bagmati River to the south of Kathmandu. Patan Durbar Square offers the finest display of Newari urban architecture in Nepal. There are temples devoted to Shiva, Krishna, Ganesh and Vishnu all actively visited by residents and visitors. At the northern end of the square the ancient sunken water tap has been restored and is still in use with young girls filling huge jugs from the carved stone waterspouts. The courtyards of the Royal Palace with their ornamented windows, columned arcades, shrines and sunken royal bath are amongst the loveliest in all Kathmandu. AM: Sightseeing to Pashupatinath & Boudhanath. PASHUPATINATH: situated approx. 4 km east of Kathmandu city, Pashupatinath temple is one of the holiest Hindu temples dedicated to Lord Shiva. Situated, amidst a lush green natural setting on the bank of the sacred Bagmati River, the temple built in pagoda style has gifted roof and richly carved silver doors. Visitors will be permitted to view the temple from the east bank of river Bagmati, entrance in the temple being strictly forbidden to all non-Hindus. Pashupatinath is the centre of annual pilgrimage on the day of Shivratri which falls in the month of February/March. Behind the temple are the cremation grounds. BOUDDHANATH: This stupa, approx. 7 km east of Kathmandu city is one of the biggest in the world of its kind. It stands with four pairs of eyes in the four cardinal direction keeping watch for righteous behavior and human prosperity. This Buddhist stupa was built by King Man Deva at the advice of Goddess Mani Jogini. It is built on an octagonal base inset with prayer wheels. The shrine is ringed by houses of Lamas or Buddhist priests.